The relationship between the symptoms of anxiety, depression and social functioning among children, with and without ASD, are poorly understood. 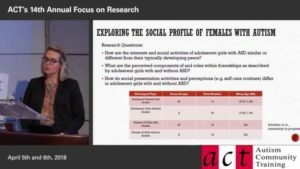 In this 25 minute presentation, Dr. Grace Iarocci presents a study into whether generalized anxiety and depression symptoms in children ages 6-14, with and without autism, were associated with social competence, after accounting for IQ, age, and gender. Dr. Iarocci will discuss the importance of assessing both internalizing symptoms and social difficulties in children with ASD and the implications for treatment. Describe the incidence of generalized anxiety and depression symptoms in a school-age community sample of children with and without ASD. 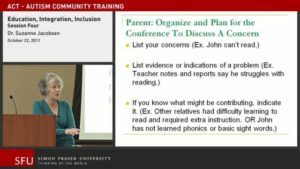 Identify assessment measures that can be used to assess anxiety and depression symptoms and social competence in children with and without ASD. Recognize the reciprocal impact of anxiety and depression symptoms on social functioning in children with ASD. 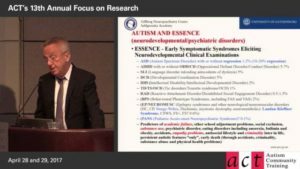 Dr. Iarocci is a professor of psychology at Simon Fraser University and the Director of the Autism and Developmental Disorders Lab. Dr. Iarocci is also a practicing psychologist in BC who specializes in assessment, diagnosis and interventions for children and adults with ASD.